Australia is a vast country and hiring a car in Australia is by far the easiest way to get around. Divided into the six states of New South Wales, Queensland, Victoria, Tasmania, South Australia and Western Australia, most of Australia’s population live in urban areas along the east or south east coast. Australia has plenty to discover, with a variety of landscapes that range from subtropical rain forests in the northeast, mountain ranges in the southeast and the famous ‘outback’ region of semi-arid desert landscape that covers the centre of the country, not to mention some amazing world-class cities that are an attraction in themselves. Australia’s East Coast is one of the most popular destinations for travellers, and depending on where you want to visit you can collect your cheap car rental on arrival at Sydney Airport (SYD), Canberra Airport (CBR), Melbourne Airport (MEL), Brisbane Airport (BNE) or Gold Coast Airport (OOL). From Sydney, you can take a tour the Hunter Valley Wine region, before driving north along the Pacific Highway, towards the city of Brisbane. Stop off at Port Stephens, Port Macquarie and Stuart’s Point, a great place for Kuala spotting, before reaching Coffs Harbour, one of the busiest and largest towns along the highway. Drive your car to the laid back town of Byron Bay, an iconic Australian beach destination, before heading along the Gold Coast, where you will find the wealthy resorts of Palm Beach and Surfers Paradise, and the city of Brisbane, Queensland’s capital beyond. Queensland is home to some wonderful destinations, and exploring in your car is highly recommended. Travel along the Great Sunshine Way towards Noosa and Hervey Bay, where you can catch a boat over to Fraser Island, or continue driving north to Bundaberg, a historic sugar cane city and a gateway to the unforgettable Great Barrier Reef. Snorkelling, diving and surfing are the main draws of this region, and if you travel north towards Cairns, you will find yourself at Airlie Beach, a popular launch point for boat cruises around the Whitsunday Islands. Magnetic Island, Tully and Mission Beach are great destinations for nature lovers, and if that’s not enough, once you reach the city of Cairns, you should take time to explore Daintree National Park, Port Douglas and Cape Tribulation in your Cairns cheap car rental. Cairns is often a starting point for a journey into the Red Centre, to the town of Alice Springs and the iconic Ayers Rock, or Uluru, to give it its Aboriginal name. To drive from Cairns will take about a day and a half, and you may find it easier to catch a flight, picking up your cheap car rental at Alice Springs Airport (ASP). Driving from Alice Springs to Ayers Rock will take about six hours, and often it will be just you, a few tour buses and some kangaroos on the road. Try to arrive before sunrise and either walk up or around the huge rock, before hiking through Kata Tjuta and Kings Canyon. There are plenty of options to stay in the Ayers Rock region, or you can drive back to Alice Springs, and begin your drive north to the port city of Darwin, via Kakadu National Park. On the south east coast, in the state of Victoria, you can hire one of our cheap cars in the fashionable city of Melbourne, renowned for its street art, food culture and café scene, whilst further west, about an eight-hour drive from Melbourne, in the state of South Australia, lies the city of Adelaide, where our Adelaide car rentals will be waiting for you. In the far west, in Western Australia, is the city of Perth. Perth is a laid back city that lies on the coastal plain alongside the Indian Ocean. Hiring a cheap car in Perth is the best option for getting around, and the city is surprisingly car friendly. 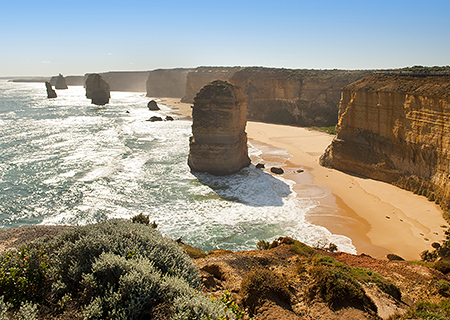 Australia is a fabulous country to explore, and for many visitors it is a once in a lifetime experience, so make sure you make the most of your visit when your hire a car with Bingo Car Rental. Bingo Car Rental is the place to come if you are looking for cheap car rental in Australia. For a family vacation or road trip with friends, hiring a car is often the cheapest way to get around, giving you the freedom and flexibility to explore at your will. Find out how you can keep your rental costs to a minimum when you search online with Bingo Car Rental, so that you make big savings on your holiday. We are able to present you with prices that are up to 30% cheaper than renting the same cars directly from the car rental company, and by comparing prices from the leading car rental agencies such as Avis, Sixt and Europcar, we ensure you get the rental car you are looking for at the lowest rates available online. A compact car, supermini or small city car… whatever name you give it, this is the most economical car you can rent in Australia. Ideal for couples, small families or city driving, not only are compact city cars the cheapest rental category, you will also find that these simple little run around cars keep fuel costs to a minimum. Look out for cars that deliver a good fuel economy (65 mpg being a good return, 80mpg is excellent), such as the manual transmission Volkswagen Polo with a diesel engine that delivers 74.3mpg or the Peugeot 308 Hdi, a great little small family car that delivers an impressive 79mpg. The Peugeot 107 and the Toyota Aygo are also reliable low price small cars, so choose a supermini with excellent fuel efficiency and find out for yourself how much money you can save. If you are travelling with a family and luggage, or are planning to travel long distances, a mid-size or full-size car is what you need. You can find cheap mid-size cars to hire in Australia, including the Toyota Auris Hybrid and the sporty Hyundai i30 automatic tdi. The larger Toyota Prius Hybrid is also a good option, delivering an impressive fuel economy of 83.1mpg, saving you money on your gas. Other cheaper full-size cars include the Volkswagen Passat and the Mercedes C Class, giving you the space and comfort you need for a long journey whilst you reduce rental costs and petrol consumption. Renting a Minivan or People Carrier in Australia is the cheapest way to transport 8 or more people, and you can take advantage of the great deals that Bingo Car Rental can offer online. The Chevrolet Spin is a simple yet stylish and comfortable 8 passenger MPV, the 9 seater diesel Fiat Scudo is an economical minivan, whilst for larger groups, the 12 seater Hyundai H1 delivers a great performance and excellent fuel economy. If you are planning a long road trip or a weekend in the country, a Toyota Previa Campervan rental might be the cheapest option for you, providing you with the freedom to travel in comfort and style, as well as an affordable, comfortable and safe place to sleep.